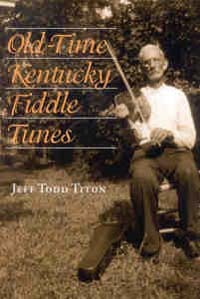 For years fiddlers and folklorists have prized the old-time fiddle tunes from Kentucky. Many of the most outstanding country music artists hail from the state, including Bill Monroe, widely regarded as the founder of bluegrass music. Even Aaron Copland lifted, note-for-note, a Kentucky fiddler’s performance of “Bonaparte’s Retreat” for the “Hoedown” section of his ballet Rodeo. That tune and nearly 200 others are transcribed here, most for the first time. They are taken from recordings of Kentucky fiddlers, many of whom were born before 1900, practitioners of a style of playing now extremely rare. Jeff Todd Titon places the tunes in their historical context, provides biographical sketches of the performers, and offers suggestions for contemporary fiddlers who want to use the book for performance. A compact disc of recordings is also included. Jeff Todd Titon, professor of music and director of the Ph.D. program in ethnomusicology at Brown University, is the author of numerous books on American music, including "Early Downhome Blues".